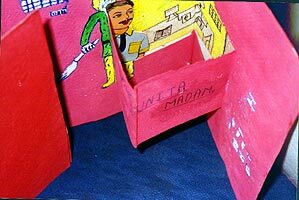 Tales of Reality and Imagination: A book-making workshop with under-privileged youth ranging from 6-14 years of age in New Delhi, India, inviting the children's internalizations of Indian television and films, in forming ideas of gender and class. As part of this discussion, the children also shared their own life experiences and their dreams and aspirations. After discussion, the children wrote and communicated stories hovering between reality and fantasy in handmade books. Drawing upon Memory: I worked for a year in a community center run by the Chicago Department of Aging, facilitating English and Second Language (ESL), visual art, and bookmaking classes with elders. We talked about images that linger in our minds in life, those that elude us and become something else, and those we want to communicate to others. I worked with media the elders were most interested in working with, including watercolors, and collage. Storybooks: I worked with Pre-K and 1st grade students, in an after-school program at the Lab School at the University of Chicago, helping them write stories and create their own handmade story books. Time to breathe: As a volunteer in a women's shelter in Chicago, I conducted artmaking workshops with the children living in the shelter. The time I spent with the children focused on seeking and finding visual cues that evoked a sense of peace and happiness in them.